If you are one of the lucky ones with maple syrup trees in your backyard and were able to take advantage of this sugaring season, you might be wondering what to do with all that syrup. Fear not, we have a solution for part of it at least you may not have considered. I decided to do a little experiment with the remaining venison in our freezer that my husband and I had from last season. We have been trying to stretch it out so it would last the entirety of the off-season, but we have officially seen the end of our stash. It’s all my fault. Lately I’ve been on a maple syrup craze and adding it to everything I can think of… including our venison. 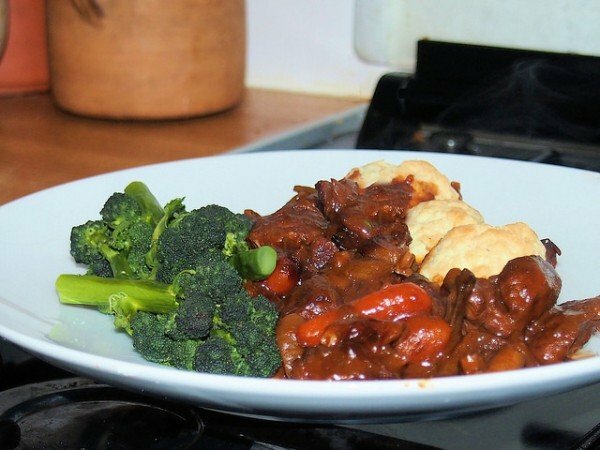 Try this recipe sweet venison recipe in your slow cooker, or bookmark it for your first deer of the season. 2-3 lbs Venison – I used steak, but you can use whatever cut you like. 1 cup Pure Maple Syrup – Did you tap your trees and make your own? Use it! The best thing about the slow cooker is that you just throw all of the ingredients together and forget about it until dinner time. Sear the meat in a separate pan before throwing it in the slow cooker. This will seal in the flavors of the meat. With all the ingredients in the pot, see that your meat is covered by the liquids in the recipe. If it isn’t, I would consider adding an extra tablespoon or two of the maple syrup or oil, or just some water, since venison does not release much of its own juices during the cooking process; you don’t want your meat to dry out. Turn it on high for 5-6 hours, but for the last hour switch it low (the 10 hour setting) and stir it a bit, if you’re around. If you happen to remember to do this early enough in the day, use the low setting (8 hours or more). Note: You can also make this recipe in a pressure cooker in about an hour. Serve with roasted potatoes and some baked asparagus. You won’t be disappointed. Bon Appetit!